Largest Crystal 1.5cm Volcanic lava flows over southern Australia miilions of years ago trapped expanding gases. The basalt rocks were later infiltrated by groundwaters which crystallised in the vesicles left by the expanding gases. 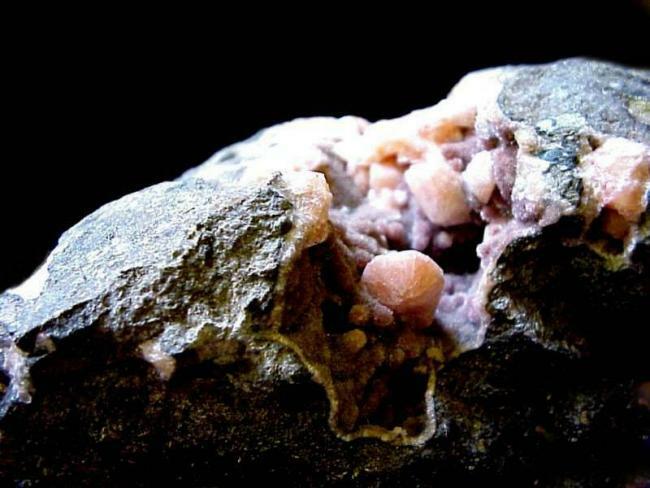 At Flinders on the southern coastline of Victoria, many rare and well crystallised zeolites, such as this pink Gmelinite have formed. The specimens are often associated with a bed of diamond-like sparkling Analcite and fine needles of Natrolite.